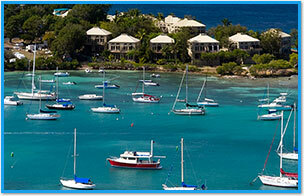 Bring your towel and let Captain Pat and her crew take you on a personalized sail to St. John and surrounding islands. They will take up to six passengers on full or half-day sails that include open bar, delicious lunch, snorkel gear and lessons, water toys, comfortable shaded cockpit, and room for sunning. Captain Pat will meet you at the entrance to Dock C at American Yacht Harbor, right by the Marina Office. From there you will board her very stable dinghy for a short ride to Independence. While her first mate makes you comfortable, Captain Pat will take the helm and steer you to a perfect spot. 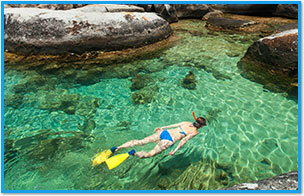 You'll have plenty of time to snorkel before lunch. After a quick shower on deck, it will be time for a delicious hot lunch! Dessert - of course - is decadently chocolate! After lunch, you might sail to another location for snorkeling, or stay right where you are and enjoy sunning, swimming, limin' in the water, or even a nap. It's all up to you because It's Your Day!